The doors of the Maryland governor’s mansion were open to the public for the free Holiday Open House on Saturday. Folks braved the cold to take a look-see inside. See photos. ANNAPOLIS, Md. 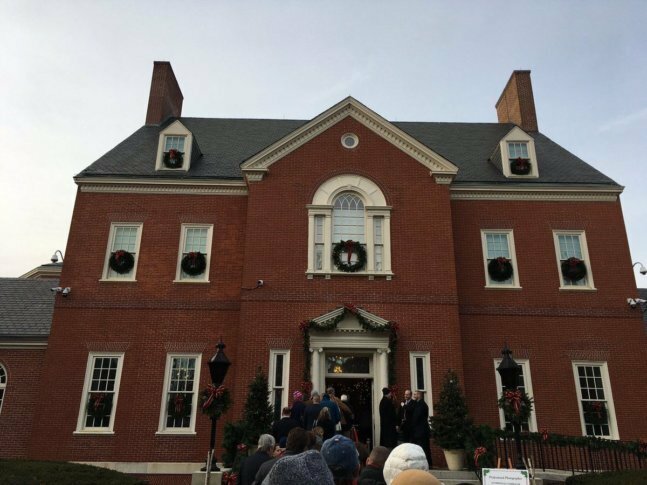 — The doors of the Maryland governor’s mansion were open to the public for the free Holiday Open House on Saturday. Folks braved the cold to take a look-see inside. The line of visitors stretched outside the mansion gates and around two corners at one point during the afternoon. Maryland Gov. Larry Hogan and first lady Yumi Hogan greeted visitors and posed for photographs with visitors in front of a festive Christmas tree, while others opted to skip the snapshots and headed to parts of the mansion that were open to the public. “I’ve been in Annapolis for over 25 years and have always done this before with my children,” said Laura from Annapolis as she waited to enter the mansion. She brought her partner, Ben, for his first open house visit. Jeanne, who traveled from Maryland’s Eastern Shore, gathered with her daughter, grandchildren and a former co-worker to take in the holiday sights. “It was beautiful inside — so Christmassy,” Jeanne said after her walk through the mansion. Her daughter got a kick out of the governor’s “man cave” which is complete with a large-screen television, sports jerseys and includes autographed footballs and basketballs from local teams. One mother told WTOP that her visit was an honor. “My son, along with three other friends, they’re invited to perform inside,” said Xiaoyan Song. She told WTOP they represented a music group from River Hill High School in Clarksville, Maryland. The entertainment lineup also included the Delaney High School String Ensemble and the Huntingtown High School String Quartet.